Emergency medical services include careers such as paramedic and EMT (emergency medical technician). Emergency medical services professionals respond to emergency situations such as heart attacks, head injuries, car accidents, fires, and crime scenes. They do what is necessary to stabilize and transport patients via an ambulance to a hospital, if needed, for continued care from a physician. Depending on the type of role and level of certification, emergency medical services professionals provide basic first aid or life-sustaining support such as CPR. This field is projected to grow 15 percent by 2026, much faster than average. The need for these services is constant. About half of the people in this field are employed by ambulance services, 28 percent by local governments, and 18 percent by hospitals. Jobs in this field often involve working nights, weekends, extended shifts, or on call. Emergency Medical Responder (EMR): These professionals provide basic medical care while awaiting other emergency medical services to arrive. Other job titles include Emergency Care Attendant and Certified First Responder. Emergency Medical Technician (EMT-Basic or EMT-B): An EMT cares for patients at the scene and during transport in an ambulance. This professional can assess the patient and manage trauma, cardiac, and respiratory emergencies. It is the common entry-level position and it is a requirement before continuing with paramedic training. Advanced Emergency Medical Technician (EMT-Intermediate or EMT-I): In addition to the basic skills, this professional has received additional training and in some states can administer IV fluids and give allowed medications. Paramedic (EMT-P): A paramedic has more extensive training. Their skills include starting IVs, advanced airway management, resuscitation, interpreting EKGs, and administering medications. EMT and paramedic courses may have eligibility requirements and prerequisites. Some programs require paramedics to get an associate's degree. Acceptance to the paramedic course requires first being certified as an EMT and completing six months of work experience as an EMT. After completing your studies, you take the National Registry of Emergency Medical Technicians EMT or Paramedic computer exam. Upon passing, you can obtain your certification. You will then need to be licensed in the state where you will practice. This may require taking a state exam. 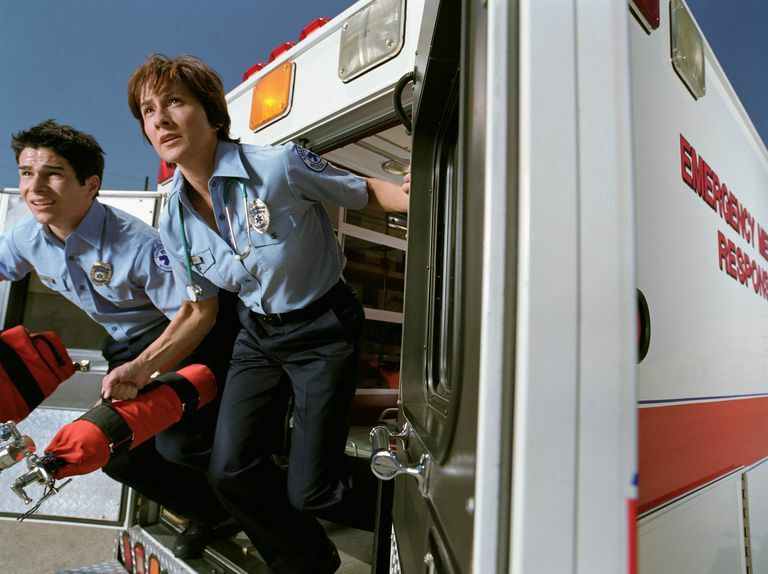 Who Should Consider a Career in Emergency Medical Services? Rod Brouhard was interviewed to provide insight into EMS training. He is a paramedic who has served as operations manager at American Medical Response and directed the EMS program at Modesto Junior College. Brouhard says EMS workers must be able to work extremely well under pressure and think quickly to assess and treat people in emergency situations. As first responders to emergencies, EMS workers may see and experience traumatic situations and accident scenes. Therefore, if you are interested in a healthcare career, make sure you can handle difficult and highly stressful situations before you pursue a career in emergency medical services. Additionally, while EMS workers do earn a good living, they are not among the most highly paid health professionals. Be sure to compare salaries of the various health professions that interest you to determine what you want or need to earn before pursuing a career in emergency medical services. It's a very challenging career that does entail some investment of time and education, so consider your options carefully.